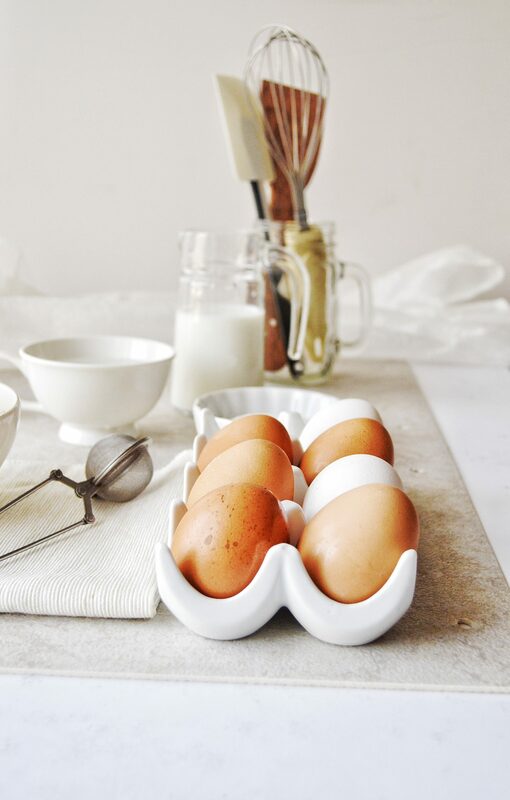 I love an indulgent breakfast, usually on the weekends or holidays when my loved ones are there at home. I get so excited to make breakfast that time. 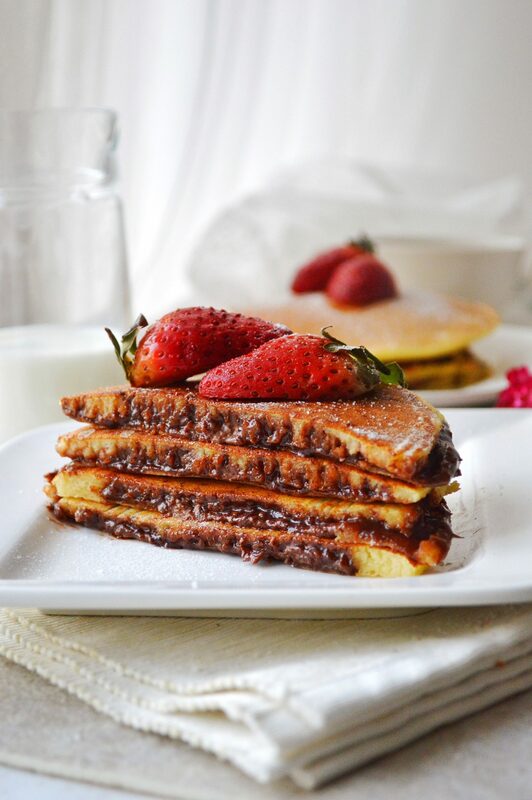 I made these Nutella stuffed pancake yumminess and served it with strawberries this weekend and it was no doubt, a success story here. 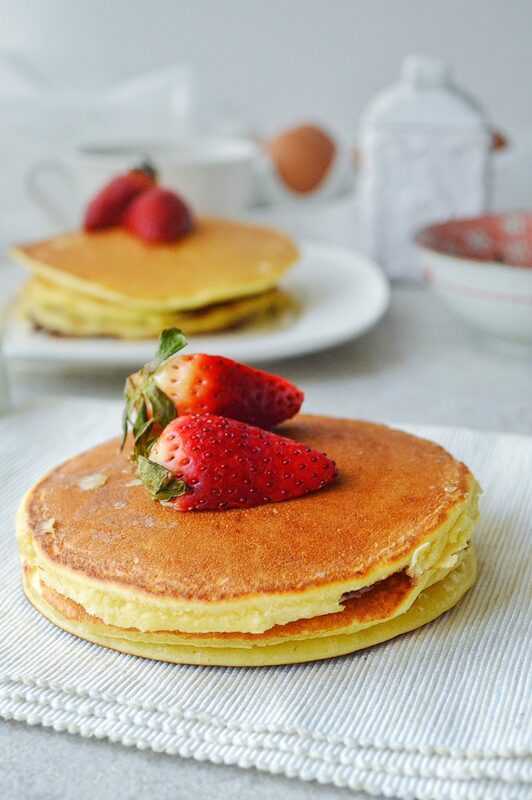 When i saw this recipe of Nutella stuffed pancakes in Nagi’s blog Recipetineats, i immediately knew that i will be including them in my breakfast recipe collection. Regular, plain pancakes are a bit too boring. 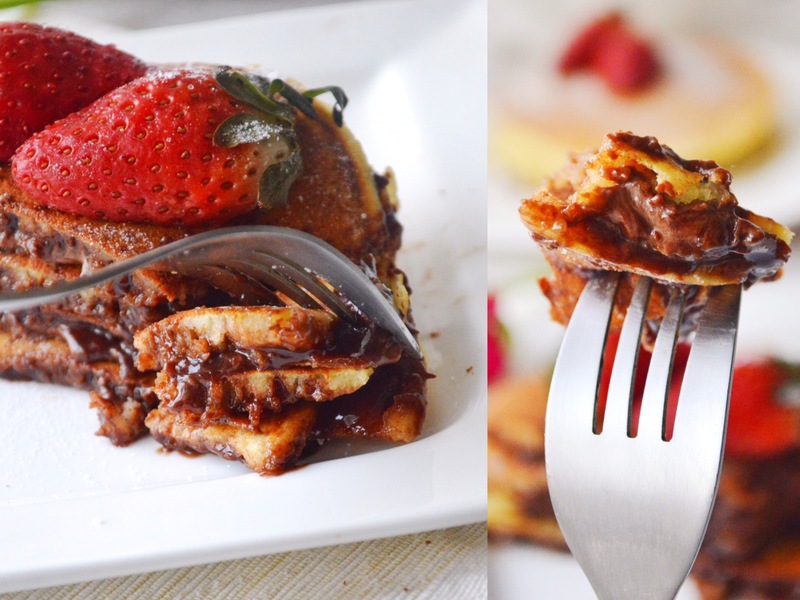 Pancakes filled with Nutella….that is my kind of pancake. I can’t thank Nagi enough for this glorious recipe. Loved the way she stuffed the Nutella inside the fluffy pancake, i don’t think i could have ever thought of this idea. She made frozen pancake shaped Nutella disk and sneaked it in between two layers of pancake in the pan. Genius!! I don’t think i did complete justice to her recipe, but it sure tasted sooooo good. You guys must hope on to her page to see how beautifully and neatly she presented hers. Don’t get discouraged if the first pancake doesn’t come out perfect. My first pancake is always a mess. You just have to adjust your heat after covering the nutella with the extra batter. ✔️ Make a medium size Nutella disc, don’t make it too thick because Nutella will ooze out from everywhere when youcook and it will be a mess. At the same time dont make it very thin as it will be very hard to handle. And if at all the Nutella oozes out, make sure to wipe that off the pan before you make the next pancake or else it will stick onto the pancake. ✔️ By wiping the butter you will get a nice, even golden color on the outside of the pancake. ✔️ You wouldn’t need full 1/4 cup of batter to cover the Nutella, as the pancake will get very big and thick. ✔️ Be sure to adjust your heat if needed after covering the Nutella with the extra batter. You don’t want the underside to get super dark before it’s time to flip it over. You’ll get the hang of this after your first or second pancake. Line a tray with baking paper or silicon mat and spread 1 1/2 to 2 tbsp of Nutella into a disc of around 2 1/2″ in diameter. Make about 7 discs. Place the tray in the freezer and let it get firm. Keep the discs in freezer untill required. 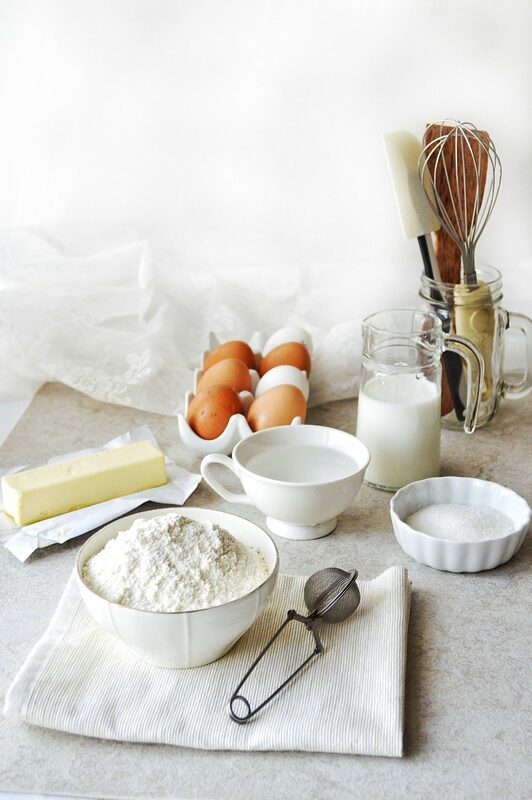 Sift the dry ingredients or just whisk the dry ingredients. Make a well in the centre and place wet ingredients in it. Whisk until combined making sure not to overwhisk. Melt 1/2 tsp butter in a non stick pan over medium heat. Once melted, wipe off most of the butter with a paper towel. Take out 3 frozen Nutella disc from the freezer before you cook. Pour 1/4 cup of batter into the frying pan. Quickly place one frozen disc in the middle of the batter, then pour a dollop of batter on top to cover the disc. After around 2 minutes, bubbles will start to appear on the outside, lift the edge and see if it is golden underside. Then flip and cook until the other sode is golden. Repet with remaining batter. Use more butter after 3rd pancake and try to get 6-7 in total. 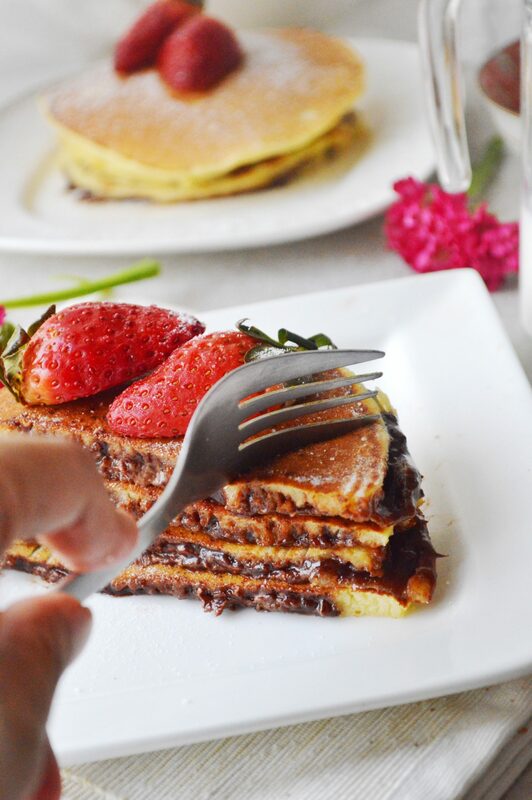 Fluffy pancakes with Nutella inside. * Make a medium size Nutella disc, don’t make it too thick because Nutella will ooze out from everywhere when youcook and it will be a mess. At the same time dont make it very thin as it will be very hard to handle. And if at all the Nutella oozes out, make sure to wipe that off the pan before you make the next pancake or else it will stick onto the pancake. 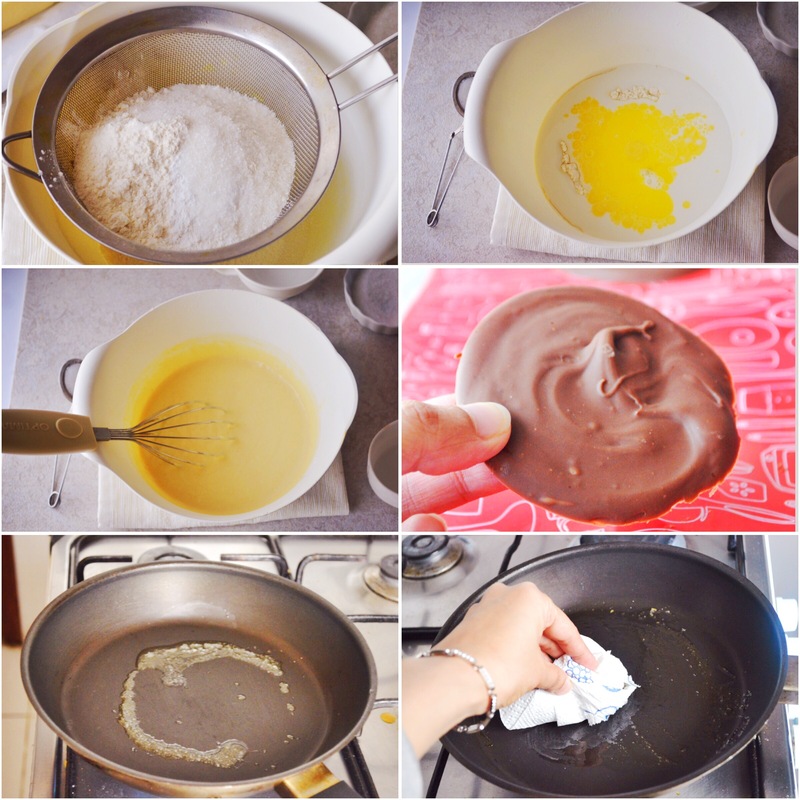 * By wiping the butter you will get a nice, even golden color on the outside of the pancake. 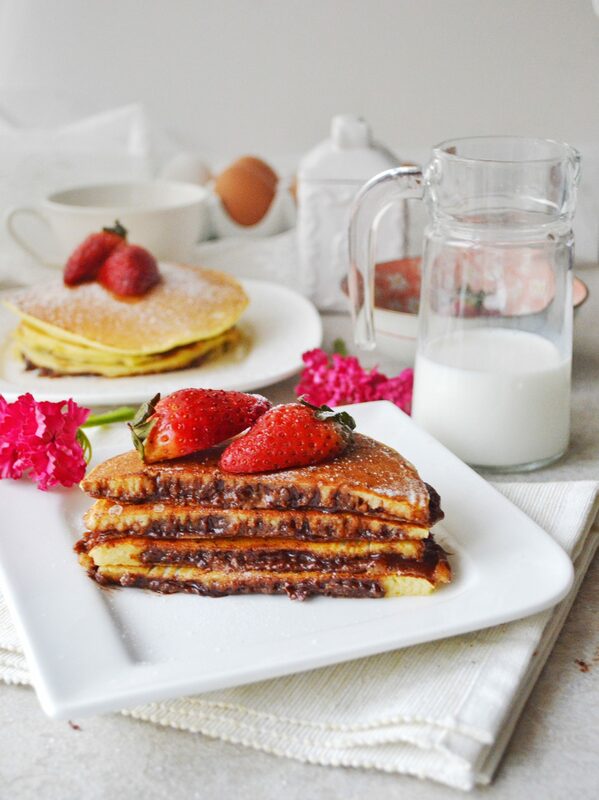 * You wouldn’t need full 1/4 cup of batter to cover the Nutella, as the pancake will get very big and thick. 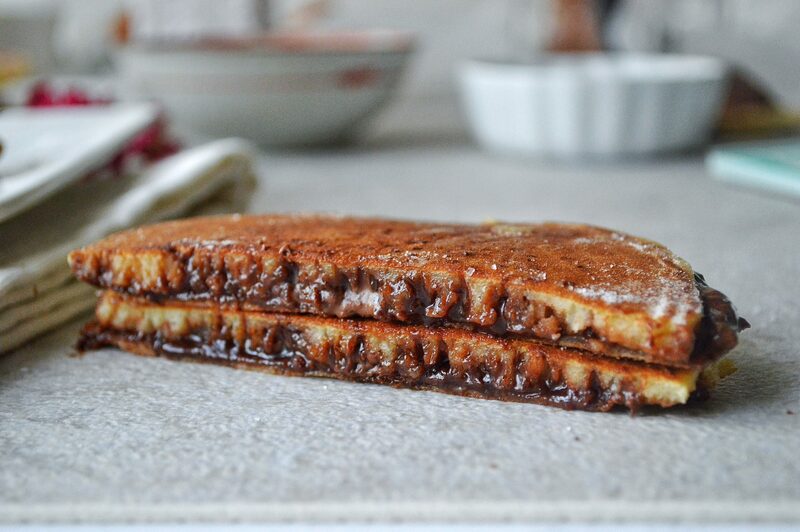 * Be sure to adjust your heat if needed after covering the Nutella with the extra batter. You don’t want the underside to get super dark before it’s time to flip it over. 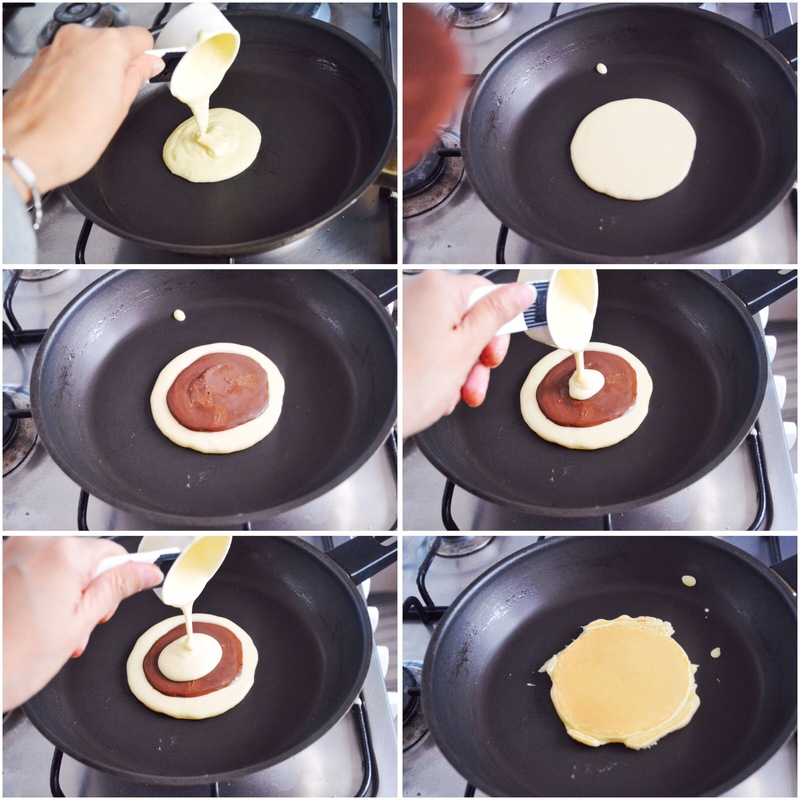 You’ll get the hang of this after your first or second pancake. Oh, what a super-sweet and tasty treat! Thanks dear! Very true, i love food with little surprises inside too.